Let’s be honest—ProCamera is not the perfect solution for every issue you may encounter when taking pictures with your iPhone. And it doesn’t do a lot of neat photo trickery to make your pictures look better. All daemgen.net’s app tries to do is keep your photos focused and sharp. Steady as She Goes: ProCamera uses the iPhone’s built-in accelerometer to figure out when you’re holding the phone steady, shooting the picture at that precise moment. 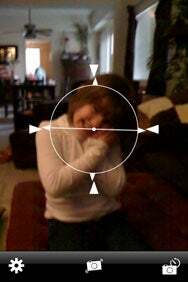 ProCamera uses the iPhone’s built-in accelerometer to judge when the phone is being held steady, and waits for that moment to shoot the picture—certainly an innovative use of the technology. There are different settings to adjust the sensitivity of the accelerometer and when it takes the shot, but why bother? Assuming you always want the sharpest picture possible, the highest setting works just fine. A self-timer is part of the package, with a good and loud beeping countdown, perfect for taking the occasional self-portrait. The app also shows you a tilt-meter, a circular image that lets you know if your picture is on the straight and level. This is also a good indication of when you are holding the phone perfectly still, so you can get the app to take the darn picture, already. If you don’t have a very steady hand to begin with, it can take a while before the app decides you are ready and steady enough to actually shoot. Blurry or not, this leads to some missed opportunities. Adjusting the accelerometer sensitivity helps speed things up a little, but that would seem to defeat the point of having an app whose purpose is producing the steadiest shot possible. If keeping your phone straight and getting constantly blurry images are big problems for you, ProCamera may offer a solution to your camera troubles. If you are looking for more control over your images in addition to that nifty self-timer, you may want to look elsewhere. ProCamera is compatible with any iPhone running the iPhone 2.1 software update.